These tongs feature Cuisipro's patented locking mechanism, handle grooves for a better grip, silicon ends for non-stick pans and the rounded teeth are strong but grab food gently. These one-of-a-kind hand-carved teak wooden spoons are simply stunning. A perfect accent to your table. 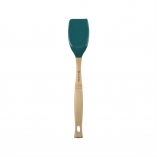 4 size options available ranging from the multi-purposed 11" spoon to the 3" scoop. A beautiful and functional addition to your kitchen. Hand carved - each is one-of-a-kind. Mini Turners & Whisks - 24pc CDU. Includes 12 each of white whisks and yellow turners. Made of heat resistant silicone and stainless steel. The optimal home for your spoon to eliminate counter-top mess. Details: 9" long Dishwasher and microwave safe. Beautiful for a dinner party or everyday use. Made from dishwasher safe, highly polished 18/8 stainless steel. 10″ overall length, 3-1/4″ wide bowl. As a carving or serving fork, you´ll have a good hold on most anything. Use the tines to test if food is ready. Cuisipro black nylon locking tongs are excellent to use on nonstick cooking surfaces as they are less abrasive than stainless steel. 12"
Stainless steel locking tongs from cuisipro. Easy to use, dishwasher safe. Heavy duty, alpine beechwood spoon. Great for every day use.10"
Heavy duty, alpine beechwood spoon. Great for every day use.12"
Heavy duty, alpine beechwood spoon. Great for every day use.14"
Heavy duty, alpine beechwood spoon. Great for every day use.18"